Both projects are located within the 1,000-acre Laguna Phuket – Asia’s finest integrated resort complex, and home to an 18-hole golf course, award-winning spas, watersport facilities, a boutique shopping village and more than 30 bars and restaurants. “Hong Kong has always been a strong source market for Phuket and with Banyan Tree Group’s track record we always receive a high level of interest for our lifestyle and investment options. This time around, we are proud to present two of our newest projects at Laguna Phuket – the final phase of Cassia Residences, suitable for homeowners looking for a lifestyle investment and planning to spend a substantial amount of time on the island, and Angsana Beachfront Residences, which will appeal more to property investors as an attractive investment opportunity,” said Mr. Stuart Reading. Of the over 1,100 owners across all Laguna Phuket properties, approximately 15 percent are residents of Hong Kong. Similarly, of the 190 existing owners of Cassia Residences Phuket, 17 percent are residents of Hong Kong. One of the projects being showcased is the world’s first Cassia Residences, the only freehold Cassia property in the world and representing the latest phase of Cassia Phuket. 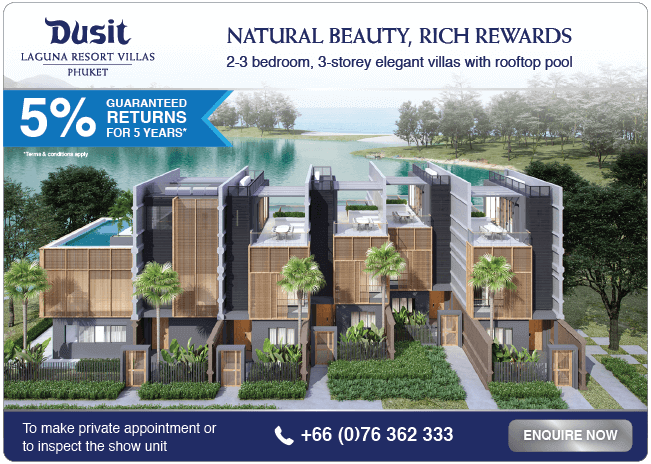 Cassia Residences is the only condominium project inside Laguna Phuket, set amid lush tropical greenery, and just a 25-minute drive from Phuket International Airport. A total of 193 units are housed in the community's low-rise buildings, each one set around a tropical lagoon and crowned with a rooftop pool that's exclusive to residents. Designed with comfort and livability in mind, the units at Cassia Residences Phuket are styled to serve the needs of the modern homeowner. Apartments come in one bedroom (50 sqm/ 538 sq. ft.) two-bedroom (75 sqm / 807 sq. ft.) and three-bedroom (119 sqm / 1,281 sq. ft.) configurations, nestled in two separate buildings, and feature lounge and dining areas that seamlessly flow into one another to form a single, open-plan integrated space. Cassia is located steps from serene Bang Tao – Phuket’s premier west coast bay with a wide sandy shoreline. Nearby and situated right on Bang Tao Beach, resort-style living takes on a whole new dimension at Angsana Beachfront Residences. Located adjacent to the award-winning Angsana Laguna Phuket resort, the waterfront apartments offer residents a choice of beach or lagoon views. Most of the phase one beachfront apartments have been reserved, and more than 60 percent of the lagoon-facing phase two units have been snapped up by investors. Articulated to take full advantage of views that sweep across a broad tranquil lagoon fringed by verdant tropical parklands, phase two apartments are spread out through five individual low-rise buildings in a unique Thai contemporary style. Containing just two apartments per floor, each of the three-storey buildings boasts a private pool at the fringes of a broad outdoor patio. The development offers a selection of two to three-bedroom residences ranging from 214 sqm to 351 sqm (2,303 sq. ft. to 3,771 sq. ft.) with spacious ground floor garden units, as well as penthouse units with a private rooftop pool and entertaining area. A unique aspect of the project is the option for owners to have their property managed by Angsana Laguna Phuket, through either an investment or lifestyle program. The investment initiative allows buyers to have their property operated full-time by the resort, whilst the lifestyle choice enables owners to reside in their property on a part-time basis, then have their property exclusively rented out by the resort for short or long-term use. Homeowners of Cassia Residences Phuket and Angsana Beachfront Residences also receive privileged access to the Sanctuary Club, a global network with more than 40 resorts and hotels and over 60 spas and 80 retail galleries, as well as membership to the championship Laguna Phuket Golf Club, voted “Thailand’s Best” in the World Golf Awards. Complimentary shuttle bus and boat services invite homeowners to enjoy the benefits of living in an integrated resort complex. At the end of an inspiring day, residents and guests can be assured that the highest standards of service and security are in place to guarantee peace of mind for the whole family. Last year, total airport arrivals to Phuket exceeded 7.5 million passengers, representing an 18 percent growth compared to the year before. So far this year, international passenger arrivals are also on the rise, with over 140 additional scheduled flights added between March and October 2017. Phuket is also undergoing a series of infrastructure upgrades and is the chosen location for a number of large scale projects, including the expansion of Central Festival shopping mall, the launch of Blu Pearl Luxury mall, as well as new underpasses and a planned light rail project. Cathay Dragon, THAI, Thai AirAsia, and Hong Kong Express all offer the 3hr30min direct flight between Hong Kong and Phuket, with a combined 5 flights per day between the two destinations. For more information, or to arrange a private inspection please contact [email protected].